After training at Derby College of Art, Nic Collins widened his experience by working as a thrower in potteries in Italy and Germany. In 1988 he moved to Devon and set up his first workshop at Powdermills and in 2000 moved to Moretonhamstead. He responded to the wild rural environment by making pots often with locally sourced clay and wood firing techniques. He is influenced by older pottery traditions and kilns as well as adaptations and experiments to create contemporary work. 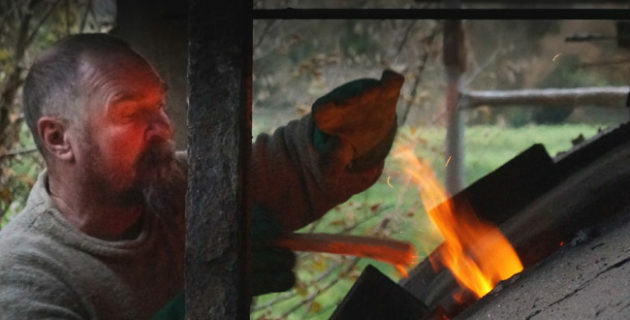 He is part of a group of experimental wood-firers including the potters, Clive Bowen and Svend Bayer who sometimes assist at each others kiln firings. These are lengthy and laborious events, involving friends working in 6 hour shifts, lasting up to 80 hours and firing to temperatures of 1300 C. He is passionate about the effects achieved by different clays, ash and shino glazes and multiple firings to create varied surface textures. New work includes large sculptural pieces fired using wet clay. 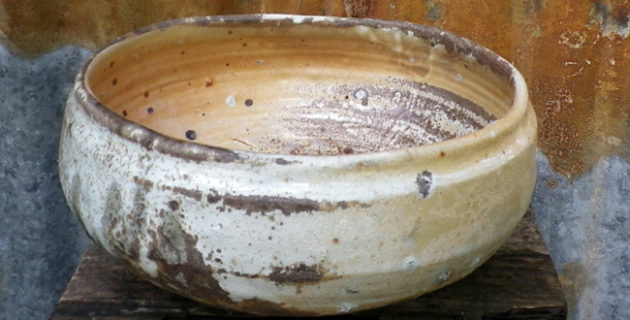 At the 2005 International Potters Festival, Nic Collins built an experimental anagama kiln over two days and then fired it over three days. For the 2019 ICF Nic will be making a ground hog type wood fired cross draft kiln. This activity is sponsored by Cromartie Hobbycraft. “My interest in wood firing began as early as my first experiences with clay. I started in the mid 1970’s, building and wood firing simple kilns. I studied at Derby under the guidance of head of ceramics Keith Maskell. I feel very lucky to have been at Derby in the mid 80’s. The training given was very comprehensive and revolved mainly around traditional wheel thrown ceramics. During my time as a student, I took a great advantage of the stack of firebricks in the kiln yard, building and firing many kilns. After many years my work has changed dramatically, as well as the design and firing methods of my kilns. My pots, although still thrown, have become more sculptural one off pieces. 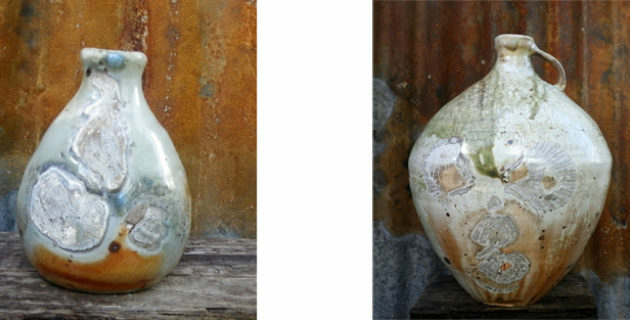 They are made to take advantage of the turbulent atmosphere in the anagama kiln. The kiln and firing has inspired me to make individual pots, which are exposed to 3-4 days of high temperature. 1320 degree+ with molten ash fusing on the surface and the live hot flame impinging on the wood. The results of each firing are analysed usually exposing another hidden secret and in turn inspiring me further into a never-ending learning adventure into the anagama kiln. It is a question, which I quite often ask myself, usually when next to the potter at a fair, making brightly coloured decorated pots, which seem to be selling like hot cakes. More than often hearing negative remarks from people who don’t even take time to stop and look! My whole life has been on the edge of normal, it’s what I enjoy! Why can’t I make pots that sell easily? But then occasionally someone else sees beyond the brown pot façade and enters the realm of the multitude of subtle colours, textures and alluring flame marks and battle won scars. Every pot from the long firing proudly records the story of the fire, with experience these give tantalising snippets of a distant memory of that pot positioned in the kiln with the white heat after 4 days of firing. I begin to understand it’s story, the direct flame hitting the front of the pot and than dancing and rebounding from the pot behind – the molten ash beginning to move vertically down the side of the pot – the feldspar granules, kneaded into the clay, beginning to melt and round off in the extreme heat. All of this information is stored and can be retrieved to read the pot. But also the rawness, nakedness, the bones are still there for all to look at! I admire the honesty of a wood fired pot. Many of my pots are made with clay that may be difficult to use, freshly mixed clay or maybe clay with stones in, as it seems that the cruder and more unique clays do not respond well on the wheel, take on their own rebellious forms and force me to work with them. These are the pots that I enjoy most, almost on the verge of collapse, maybe adding more clay to the large split, developing in the wall of the pot. “Character building” not unlike the trial of life that most of us experience, down on your knees only to pick yourself up again and become much stronger ready for the next assault. For me each firing is an adventure, a serious grappling with the unknown.